Did You Hear the One About the Homophobes Who Wanted to Adopt Out Their 16 Year Old Lesbian Daughter? Jokes are supposed to be funny. They always start with a set up and then build to a crescendo where the plot twists and the listener bursts out laughing. Last week a “joke” went viral, but no one was left laughing. The “joke” was a piece titled “PARENTS PUT 16 YEAR OLD DAUGHTER UP FOR ADOPTION AFTER LEARNING SHE IS GAY”. It came from a site called “The Memoirs of DEACON Tyson Bowers III”, and had previous iterations on the Daily Bleach and Christwire. The site it came from had other “credible” material such as KENTUCKY MAN SUES MOTHER FOR NOT ABORTING HIM, DANGERS OF PRIDE WEEK, STUDY: LESBIANS MORE LIKELY TO EAT FISH, AFRICAN AMERICAN SCIENTIST INVENT SYNTHETIC WATERMELON and GAYS BUILDING SECRET PENILE SHAPED RESORT ISLAND. The piece was written as humor…satire… but none of the 72,000 who shared it took it that way. They believed it to be real. Who could blame them? The article described the mindset of a homophobic couple from “Southern Carolina” who upon learning their daughter was “gay”, sought to put her up for adoption. Those who believed the story did so because even though it was fake, the mindset itself is painfully and horrifically real. The story sped through Facebook and pages posted it, in most cases temporarily, only to take it down again with the apology that they had fallen for the hoax. The most heart wrenching thing to observe were the sweet souls who were willing to step up to help. Numerous people sought more information because they actively were looking to adopt the abandoned teen in question. Here is some news for them, and for those of you who cared about the 16 year old girl in the fake story. She exists. The story was bogus, the situation was a lie, but she is the truth. She is 16 and 15 and 14. She is male, she is female and she is transgender. Her parents did not try to adopt her out… they simply kicked her out, and slammed the door behind her. “She” is our homeless lgbt youth. She not only exists, she makes up to 40% of the total of all homeless teens, even though lgbt teens make up only 3% of the total population. So, yes. There was an article passed around the other day, and thousands were rightly outraged and cared. The article was a fraud, bur your feelings and mine were not. We need to not focus on the tomfoolery of the internet and focus instead on the WHY, the reason behind our feelings. The WHY is that there are real kids out there that need not only our indignation, but our action. Last Christmas, I suggested reaching out to them in the spirit of the season. Now I am suggesting it in the spirit of what is right. If you wanted to adopt the 16 year old in the story, find the real her and adopt her. If you wanted to send money, start a program, get involved, please do it. If you felt passion around it, please channel that passion into action. If we don’t, then the unreal story becomes real. It becomes an allegory for the progressive community who chose to adopt out its youth in need. We are better than that. Let’s not have the next viral story be ours. This entry was posted in Civil Rights, Family, Hatred, Living, News, Politics, Prejudice, Religion, US Politics and tagged Christwire, Daily Bleach, lgbt teen homeless, parents adopt out gay daughter, Rob Watson, Tyson Bowers III, viral internet story. Bookmark the permalink. 21 Responses to Did You Hear the One About the Homophobes Who Wanted to Adopt Out Their 16 Year Old Lesbian Daughter? Thank you for writing this.It makes me very sad to see and here about this, but One thing I hae noticed Is there Is a lot of out cry to help which I’m all for but not a lot of information on how to do so. In this article you say adopt or take in homeless “queer” Youth which I am more than willing to do. but how do I do that? I don’t live in a big city so there’s not a lot of groups or anything or any in the area . I will try to start one but that’s not as easy as it sounds So i was thinking if i have this problem i bet i’m not the only one. SO does any one have suggestions on what to do and how? I have one but I don’t know if it would truly work what if we designed (or used something already designed) that shows that a house is a safe house for “queer teens) or even adults then bombard every where we know with this information and do our best to make sure the people that need to know do. I know this idea is not perfect and can be miss-used and abused but so can just about any program and it seems to me to be better than not being able to do anything. plz let me know your thoughts and ideas on this. I find it so heartbreaking that parents actually treat their children that way. Parents are supposed to their children unconditionally. Even if they don’t necessarily agree with their children’s lifestyle, regarding sexual orientation, they should still support them because they love them. A person’s sexual orientation is not a switch…you can’t just flip it on and off at will. People need to realize that, and get over it. No child should ever be thrown out or rejected by his/her parents just because of sexual orientation. That’s sickening. I’ve been supporting the homeless youth shelter in Denver. They average sixty kids a night. I can’t imagine the horror of being a homeless teen so I give them money and clothes. It’s almost always hard to come out to parents, but while you are under their roof, it can be dangerous. Thank you for this post. Although I detest the word “queer”, I found this article to be very well written and informative. Thanks for sharing your views. I understand your detestment, but the current queer youth movement is trying (and in my opinion succeeded) to retake this word to empower ourselves. making light into darkness is what were all about, right? If this was a hoax, who put it out. Did someone also steal the logo from this Facebook site? While this sotry that I also wrote about was supposed to be satire, for those of us who have struggled with family and society all know that this wasn’t too far from the truth. 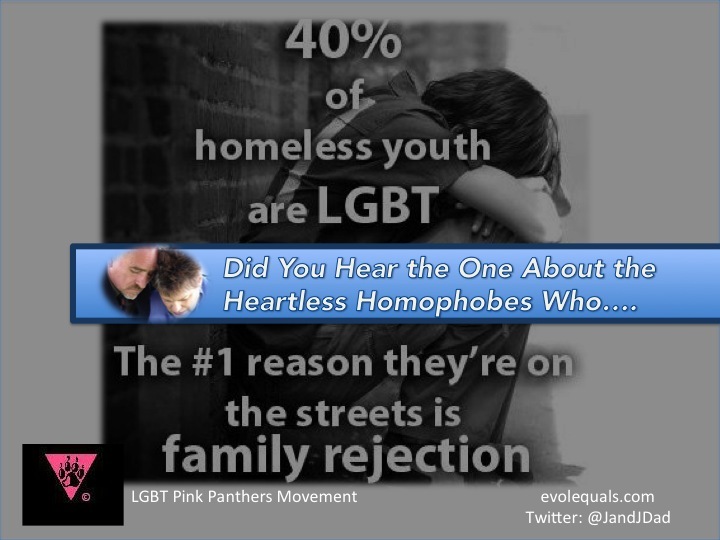 In fact, for many LGBT youth this is a REALITY. A horrific and life altering reality. So even though it is fake, it has brought attention to a serious issue – and really, isn’t that what satire is supposed to do? Thank you for writing this. It brought people to our BLOG to read Cathy’s article which had been written a few months ago. So the attention back to the real from your exposure here was important. Maybe a little bit of good came out of the hoax….. but as a victim of a serious hoax myself, I can say they are very dangerous.